This September presidential debate was supposed to be the pinnacle of my budding journalism career path but it was canceled (and moved to alternate location) back in mid-July. 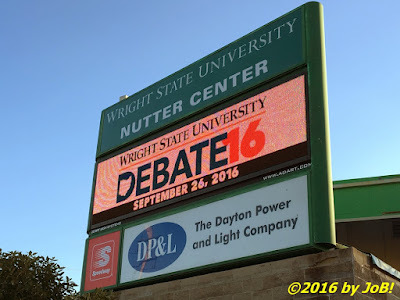 Like other significant emotional events we humans experience in our lives, I can vividly recall where I was when I first got word about Wright State University's 19 July decision to back out of the first presidential debate that was supposed to happen practically in my own backyard a few weeks from now. I was on a business trip out to North Dakota and was checking email on my smartphone after lunch before stowing it inside my car before entering a secure military facility. The cryptic teaser from the Dayton Daily News' app said that a "major announcement" was scheduled for 2pm that afternoon at the campus (I was an hour behind in the Central Time Zone) but no supporting information was provided prior to the event. It wasn't until I stepped out about an hour later to check for messages that I got to see just how devastating that press conference would be to the school, the local area and, on a personal level, to me. One of the many iterations of the McLaughlin Group cast, as depicted in this Al Hirschfeld lithograph. 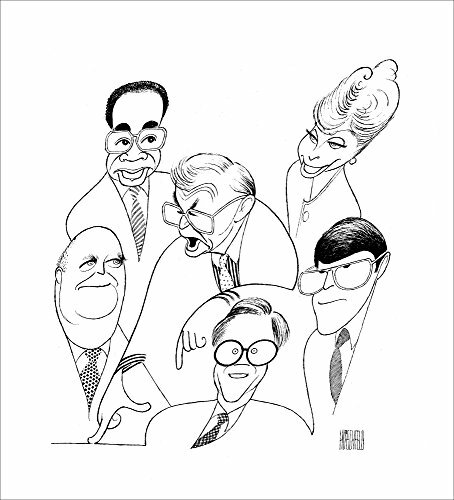 Occupying the center is John McLaughlin with (clockwise) Eleanor Clift, Morton Kondracke, Fred Barnes, Jack Germond, and Clarence Page in his periphery (image courtesy of Margo Feiden Galleries Ltd., New York). I wasn't completely surprised when I heard about the passing of political commentator John McLaughlin back on August 16th. News of his failing health, to include him missing the episode that was taped just four days prior--his first absence in the 34-year run of The McLaughlin Group television show, had come through my many social media feeds and helped softened the blow of hearing that he had succumbed to prostate cancer at the age of 89. I have not been a loyal viewer of late but a recent "peek-in" showed him looking rather gaunt and purposely placed in his host chair to perhaps provide as much comfort to him as possible. His voice sounded weaker but his mind--via the topics he personally chose--appeared to remain faithful to him right up to the very end. This recent imagery, however, does not do justice to the grandiose giant who changed how American political discourse was presented to the masses via the medium of television. 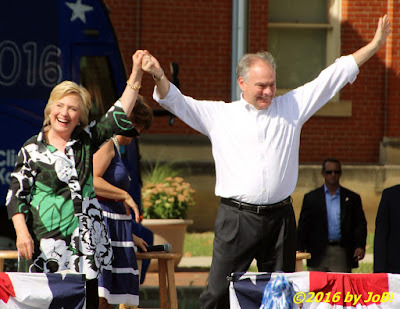 Democratic running mates Hillary Clinton and Tim Kaine wave to supporters at the end of their bus tour rally at the Fort Hayes Metropolitan Education Center in Columbus, Ohio on July 31. On July 31, Ohio's capital city played host to the conclusion of the Hillary Clinton/Tim Kaine post-convention three-day bus tour swing through the nation's Rust Belt. 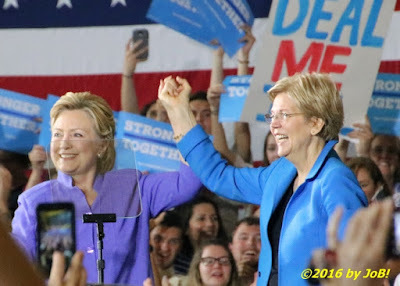 Starting in the Philadelphia suburbs on July 29th, the nominees made several stops in central and western Pennsylvania before crossing over into the "Buckeye State" late on the evening of the 30th for a rally in Youngstown. After an impromptu stop at a Cleveland-area church and another at Ashland's Grandpa's Cheesebarn for a quick food break, their two buses rolled into the Fort Hayes Metropolitan Education Center to an estimated crowd of over 5,000 enthusiastic spectators who waited nearly two hours beyond the scheduled start time. Perhaps it was the notification I received in my email inbox on Monday that thanked me for attending. Maybe it was Tuesday's observance of World Press Freedom Day that I saw continuously featured on my Google News feed. Or perhaps I'm energized by that evening's primary election rhetoric and the historic nature of the choice made by Indiana's Republican voters. Whatever the reason, I knew I had been putting off posting about this event for far too long. Three week-long out-of-state business trips intermixed with my regular hometown office responsibilities and a slight seasonal cold have put me slightly over 30 days behind in documenting my experiences at this annual gathering of rising young stars from journalism academia. With the 2013, 2014 and last year's conference under my belt, my streak continued with this year's offering held at Cincinnati's Kingsgate Marriott Conference Center on a blustery April day. 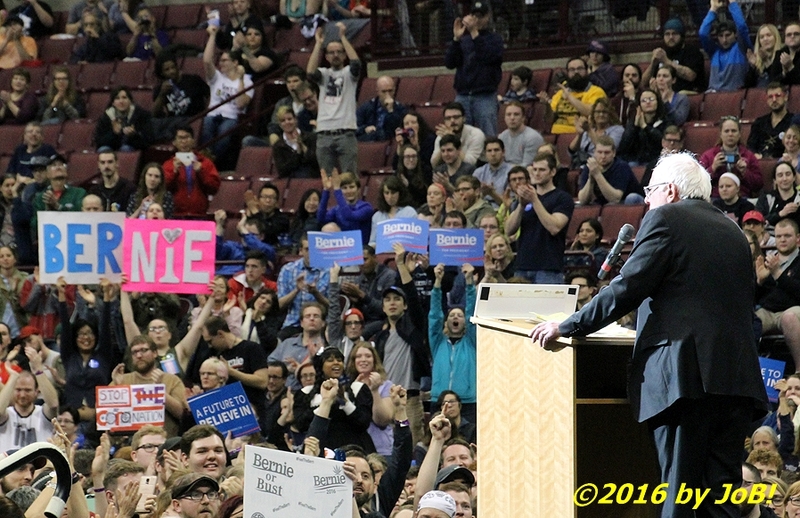 Vermont senator Bernie Sanders addresses enthusiastic attendees at his rally at the Ohio State University's Schottenstein Center on Sunday evening in Columbus, Ohio. Just two days before a potentially close and contentious Ohio primary election, Vermont senator Bernie Sanders held an enthusiastic rally in Columbus on Sunday evening to capitalize on the momentum gained in last week's surprise victory in neighboring Michigan. 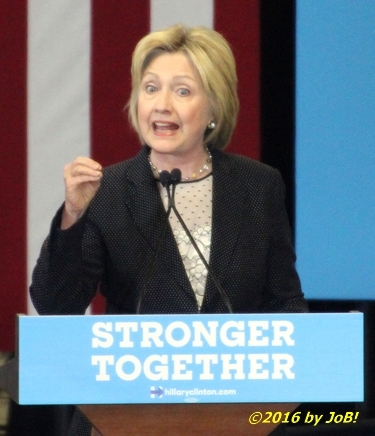 Already in the state's capital for two other events later in the evening, his campaign hosted this gathering for over 7,000 supporters at the Ohio State University's Schottenstein Center to advocate his own political positions as well as contrast them against those held by the Republican presidential candidates and his own party's primary opponent, former Secretary of State Hillary Clinton. 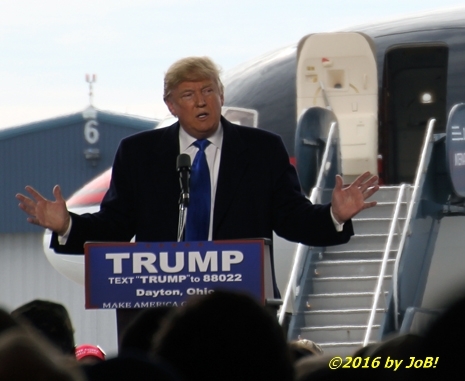 Republican presidential candidate Donald Trump addresses supporters at a rally held at Wright Brothers Aero in Vandalia, Ohio on Saturday morning. With Ohio's Republican primary election less than four days away, another high profile politician paid a visit to the Miami Valley to garner support from the region's electorate. On Saturday morning, billionaire businessman Donald Trump flew in to the Dayton International Airport to appear at an rally held at the adjacent Wright Brothers Aero facility in Vandalia, Ohio. An overflow crowd of several thousand people greeted the current Republican delegate leader in his attempt to boost his totals and to clear an easier path to securing the party's nomination at their June convention in Cleveland. 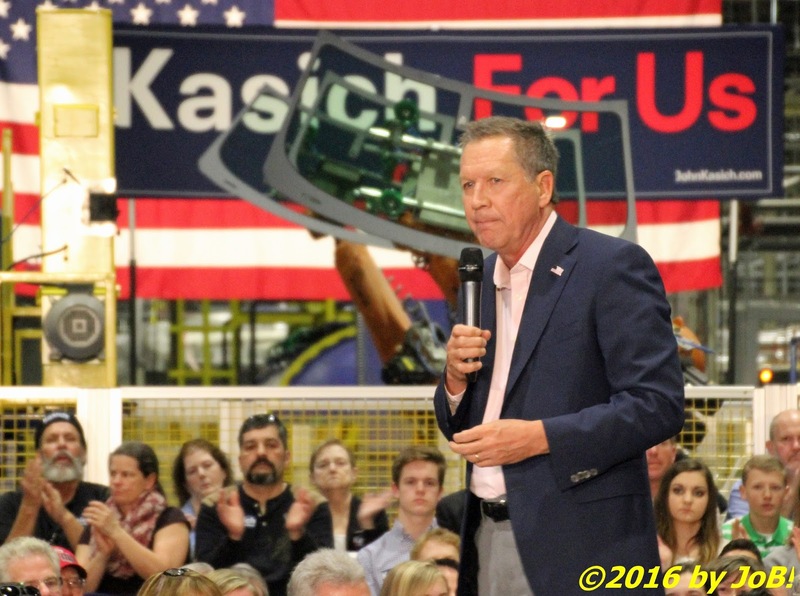 Ohio governor John Kasich begins his town hall event in support of his recently surging presidential campaign at the Fuyao Glass America plant in Moraine, Ohio on Friday evening. Encouraged by improving polling data that indicates a tightening of Ohio's Republican presidential primary race, Governor John Kasich started a 4-day, 10-event trek across the Buckeye State in a bid to continue his White House bid past next Tuesday's elections. After a visit to Lima earlier in the day, the candidate made a stop in the Miami Valley on Friday evening to conduct a town hall meeting attended by over 800 people at the Fuyao Glass America plant located in the Dayton suburb of Moraine. 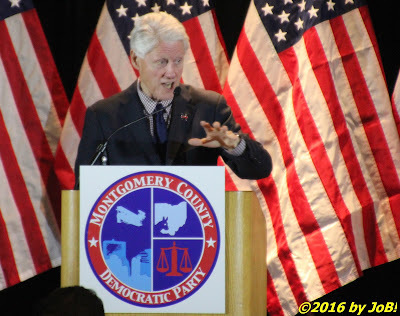 Former President Bill Clinton stumps for his wife's presidential campaign at the Montgomery County Democratic Party's annual Frolic for Funds dinner in Dayton, Ohio on Wednesday night. In the first of several high profile political visits to the Miami Valley prior to next Tuesday's Ohio presidential primary, the Montgomery County Democratic Party welcomed former president Bill Clinton to speak at the start of its annual Frolic for Funds dinner at the Dayton Convention Center on Wednesday night. This event was the last of three appearances Clinton made in the state throughout the day in support of his wife's current Democratic presidential campaign that is running in a competitive race against that of Vermont senator Bernie Sanders. Mayor Nan Whaley provided brief remarks to the overflow crowd prior to introducing the meal's guest speaker. While Clinton and Kasich are their respective parties' most qualified candidates this campaign season, their capabilities are being eclipsed by voters' preference for style over substance. Our copy of The New York Times arrived on the driveway early yesterday morning and, because of the current internet-based paradigm of "pushing" news before it's seen in print, I already knew what it contained regarding today's Iowa caucuses. 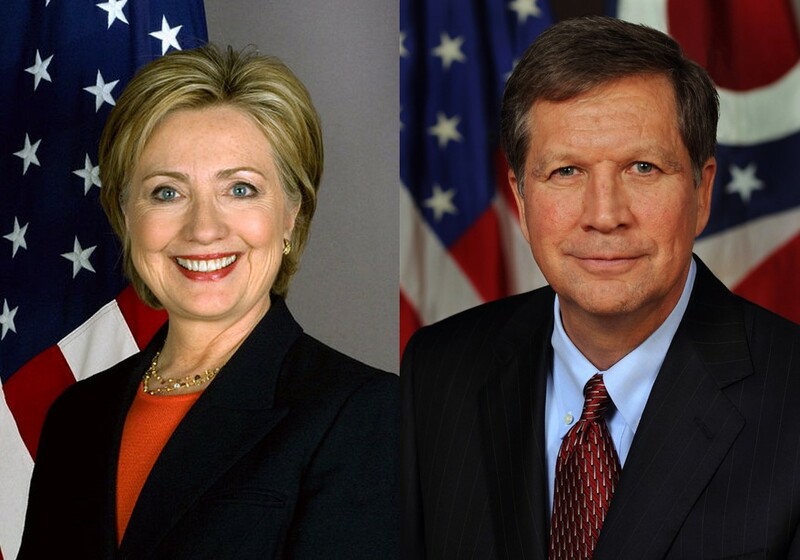 On the eve of this long-awaited start to the 2016 presidential primary process, the paper's editorial board announced its choices for endorsements--the time-honored political practice of publicly bestowing support to or approval of a person or position. With a long history of endorsing presidential candidates that goes back to Abraham Lincoln's first run for the White House in 1860 (and an overall 61 percent--24 out of 39 times backing the winner--accuracy rating for those general elections), the receipt of "The Gray Lady's" auspicious sanction was seen by many politicians as a needed boost to a flagging campaign or as yet another example of the inevitability of their cause or candidacy to the voting public. In today's social media-dominated world where everyone can have a platform and express an opinion, newspaper endorsements have diminished in importance but are still seen as "bellwethers" to gauge support within the media "establishment". Bundled-up participants march along West Third Street towards the Dayton Convention Center on Monday morning to observe the Martin Luther King, Jr. Day holiday. 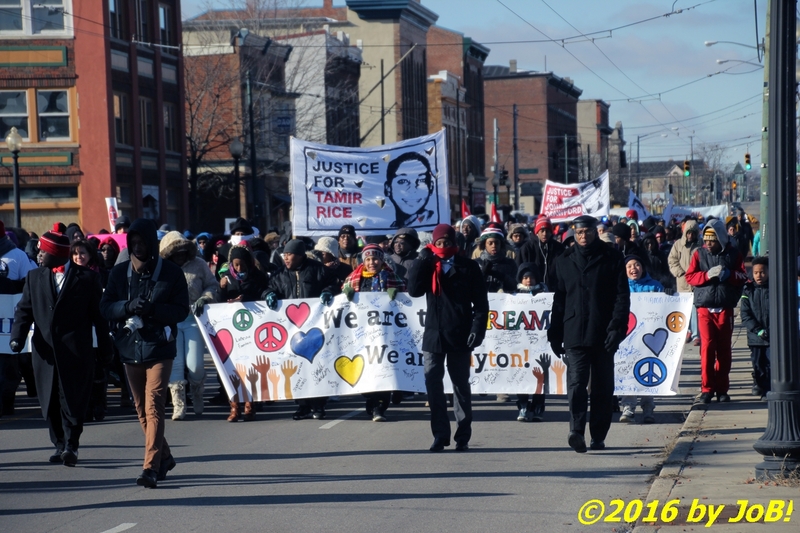 Single-digit temperatures and sub-zero wind chill warnings did not stop several hundred members of the greater Dayton community from marching and assembling on Monday morning to commemorate the life of the Reverend Dr. Martin Luther King, Jr on the 30th anniversary of the federal holiday and the 87th anniversary of his birth. The march and rally were two of eight January events sponsored by MLK Dayton Inc., a multi-racial, multi-ethnic organization established to inspire citizens to act on the vision of social justice created by the legacy of the slain civil rights advocate. 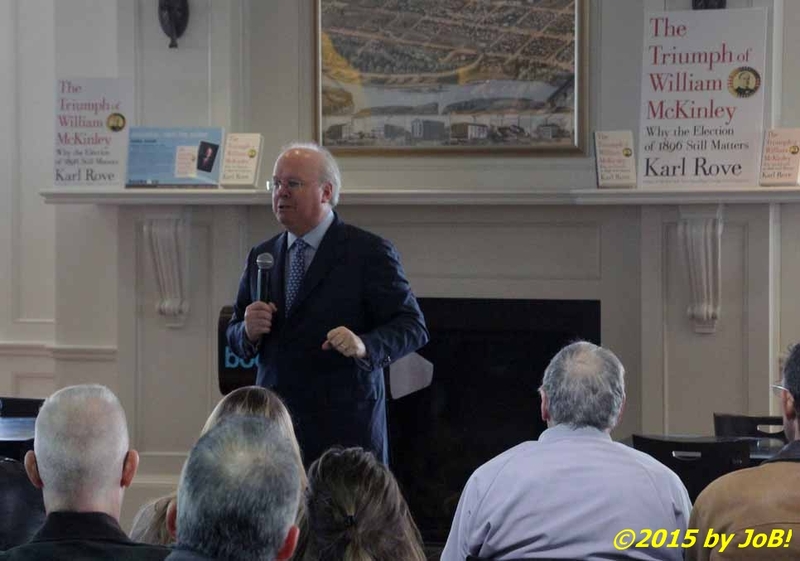 Republican political consultant and policy strategist Karl Rove speaks at a book signing event at Books-A-Million in Beavercreek, Ohio on Sunday afternoon. For an hour this past Sunday afternoon, many at an Ohio bookstore gathering were introduced to an American presidential election held in in the late 19th century to help them gain perspective on the very interesting political atmosphere in the present day. Karl Rove, a former deputy chief of staff in the George W. Bush administration and a man whose name is ubiquitous within Republican political circles, visited the Beavercreek, Ohio Books-A-Million store to sign copies of his latest book The Triumph of William McKinley: Why the Election of 1896 Still Matters. 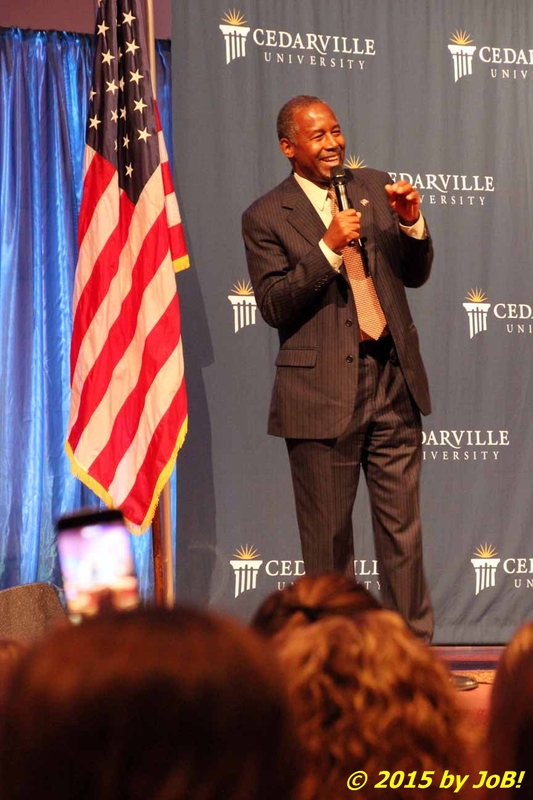 Dr. Ben Carson speaks to attendees at a rally held for the Republican presidential candidate at Cedarville University in Cedarville, Ohio on Tuesday afternoon. Republican presidential candidate Dr. Ben Carson made a campaign swing through southeast Ohio on Tuesday to help bolster his rising favorability polling numbers after a respectable showing during last week's second GOP debate. 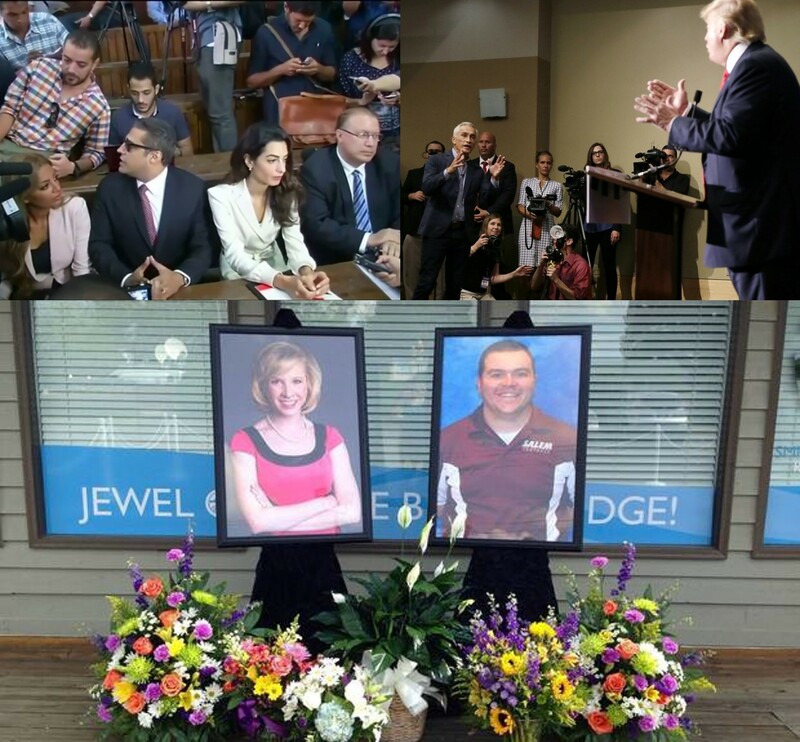 Sandwiched between a morning event in the Cincinnati surburb of Sharonville and an evening Right to Life Foundation fundraiser in Dayton, he paid a visit to the campus of Cedarville University located in the shared named Greene County village. 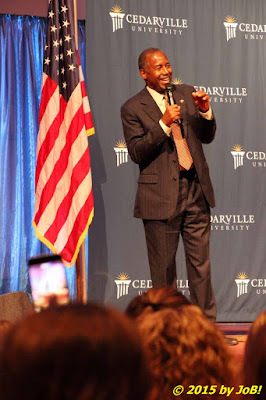 The Baptist evangelical school provided the appropriate backdrop for Carson to share views on his life, faith and politics to the capacity crowd assembled in the Dixon Ministry Center's Jeremiah Chapel. Prior to the start of the rally, Dr. Carson took questions from media members outside that venue during a 15-minute press availability where he further elaborated about comments made during a Sunday interview with Chuck Todd on NBC's Meet the Press television program concerning religious criteria for presidential contenders . I call myself a "citizen journalist"--one who currently practices the tenets of this profession in a "when I can get to it", part-time role. I do not rely upon this activity to support myself financially and have been largely absent here over the past eight months. I also conduct it without having to put my personal freedoms, my reputation, or--as horribly depicted on live television--my life on the line. Unfortunately, all three of these examples were witnessed last week and I feel compelled to comment on all of them as a member of this extended "family".